It was just seven months ago that intelligent photo aggregator app Pixable sold to SingTel, the Singaporean telecom giant, in a $26.5 million deal. It was a very nice exit for the startup, and it would be understandable for its founders to take a well-deserved breather afterward. But it turns out, Pixable’s co-founder and CEO Iñaki Berenguer isn’t one to rest and vest. In the time since then he’s worked 50 percent of his time on further developing Pixable, and also founded and led the development of Contactive, a brand new SingTel subsidiary that aims to redefine the concept of telephone caller ID for the modern world. Contactive, which Berenguer began working on in October 2012, launches today for the Android, and the app is available here. Contactive’s proposition is simple: It unifies all the contact information from social media networks with your personal address book. So when your friend John is calling you, you don’t just see his photo and email address — you also have the ability to see his latest Tweet, current LinkedIn job role, Facebook updates, and the like. But the really interesting part here is that Contactive does not just do this for people you already know. It also scans the entire web to connect phone numbers with the social network profiles they are likely to be affiliated with. This works for individuals, but a big value proposition is for businesses. How many times have you seen an unknown number show up on your mobile phone and not answered it, assuming that it’s a telemarketer — and found after listening to the voicemail or Googling the number that it was actually a call from your dentist confirming an appointment, a potential business contact who is not yet in your phone book confirming a meeting, or the bank calling with a time-sensitive question about your account? (All of these have happened to me more often than I’d like.) 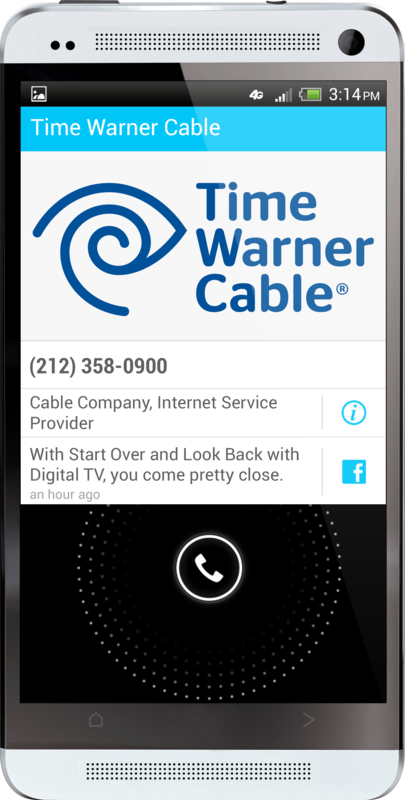 Contactive acts as a new kind of caller ID, presenting the social network information connected to that phone number — businesses often have their numbers on their Facebook and Yelp profiles — as your phone is ringing. From a technical perspective, this is no small feat, Berenguer tells me. There are seven billion telephone numbers in the world, and a massive amount of web content to crawl, to match each phone number with social network identities — and return that information within seconds so that it can be relevant from the time the phone rings to the time you decide whether to answer. “This is where machine learning, big data, and probabalistic modeling and analysis all come in,” he says. Contactive has assembled a team of 10 full-time staff, several of whom hold PhDs from the likes of MIT, to construct this technology. It is running like a startup fully funded by SingTel, with its own office in New York City, Berenguer says. So why is it coming to Android first? Berenguer says that it’s simply one of those things that can’t be done yet by an outside app on iOS. 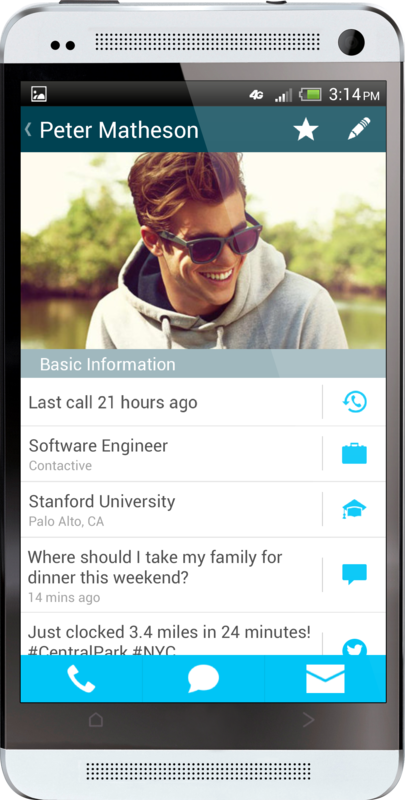 “With Android, when you have an incoming call you can capture the call management of the telephone and let the user decide which phone applicatoin to open [in this case, Contactive will intercept the call to assess the data]. With iPhone, only its own application can open the call and there is no option for another app,” he said. It’s a very simple proposition, but a useful one that seems like its time has come — as evidenced by competition in the space. It’s similar to Rapportive, but for the phone rather than email. It also seems similar to CallApp, a New York-based startup that was a finalist at Disrupt NYC last year and is available on the Android. 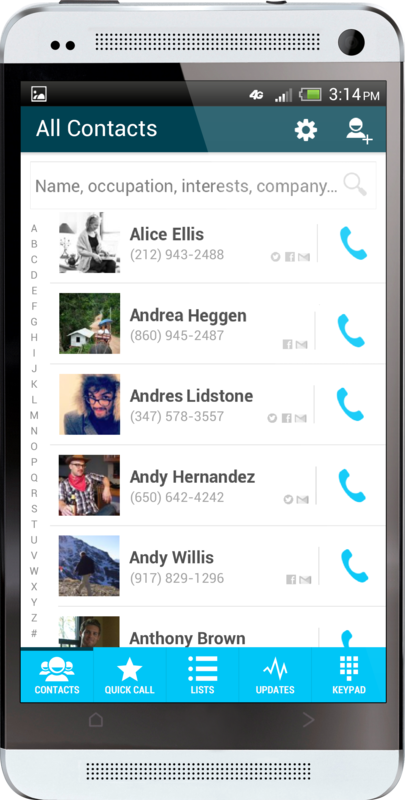 Voicemail app Youmail also has social-powered caller ID features. Ultimately, Berenguer says he is looking for Contactive to take on in the mainstream. 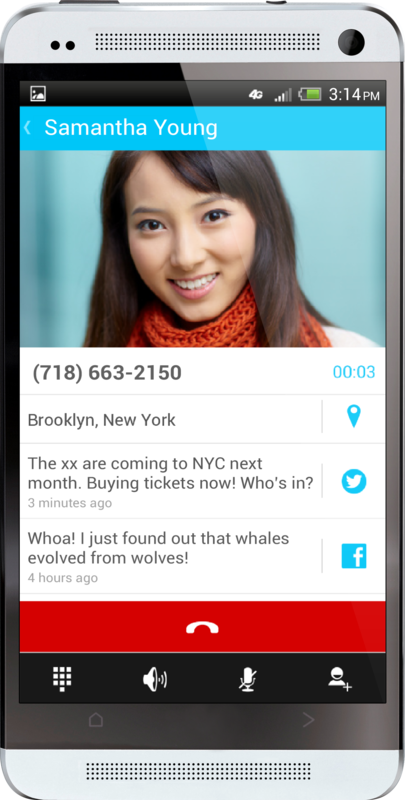 “We’re disrupting the concept of caller ID, which has been around for 20 to 30 years. It is something very simple from a user’s perspective, and it’s simple enough for people to say ‘I want that. '” Its affiliation with SingTel, which already has a user base of millions, could certainly help provide a boost in that department, and it’ll be interesting to see how it grows in the months ahead.